I often make quiches with whatever ingredients I happen to have at hand. 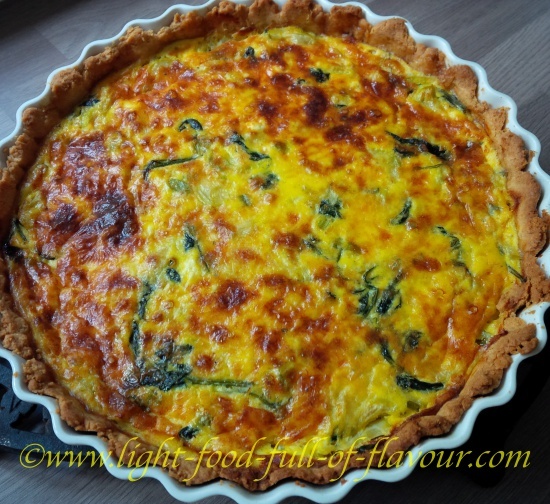 This leek and courgette quiche came about when I was visiting a friend recently. She asked me if I could make something from the vegetables she had at home. This friend of mine, although as thin as a beanpole, loves quiche and eats it quite often. But she eats tiny portions of it. Actually, she eats small portions of most things that she eats. I do unfortunately have a much bigger appetite - which is why I eat a huge portion of salad whenever I have quiche and attack the salad before eating the quiche. I like being asked to create a dish from whatever is at hand. 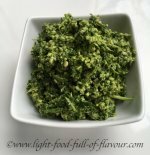 This time I found a lot of green vegetables that I felt would go well together, so set about creating the following quiche. 1. While the pastry case is cooking in the oven (200C/fan/180C/400F/gas mark 6), gently fry the leek and zucchini (courgette) together with the thyme and rosemary, if using, in the oil in a large frying pan for about 10 minutes. 2. Add the spinach to the frying pan and stir until the spinach has wilted. Take the pan off the heat and add the spring onion (scallion). Let the vegetable mix cool down to room temperature. 3. In a bowl, mix the eggs, cottage cheese and Parmesan together. Add the vegetable mix to the bowl and season with some salt and pepper. Taste and check the seasoning. When the pastry case is ready, pour the mixture into the case and bake in the oven for approximately 25 minutes – until the filling is set and nicely browned on top. Serve this leek and courgette quiche together with a salad containing lots of different coloured vegetables to make the meal healthier, tastier and full of texture.